RETIRE IN STYLE BLOG: How Do YOU Feel About Aging? All those years ago when our country experienced a financial downturn, many people's dreams of retirement went up in smoke. The hopeful retiree began to see aging in a different light. Growing old without a chance to do all those things they dreamed of was depressing. I think their damaged vision of that stage in life may have been a self-fulling prophecy. It was during that period that I read an article somewhere about how our money was going to go further as we aged. If we played our cards right in some way, things were not going to be as awful as the news predicted. Sometimes I wonder if anyone besides me read that piece. There was so much gloom and doom from every retirement adviser that the likelihood of growing old beautifully could not be seen. I think that in the end what we worry about is our money. All of the rest follows. Aging is a scary prospect when you are 30 or 40 or 50 or even 60. Will one creep around bent over and limping? All that medication needed is expensive and with a retirement income, how will a person ever afford to take care of their aging bodies? Will you be alone, afraid and broke? It turns out that the younger you are, the worse it looks to you. Scientists are discovering something very peculiar about aging: How we feel about getting old matters. A lot. So changing a thinking pattern could be the key to a happy old age. Isn't that interesting? It turns out that people like me that have arrived at "old" are saying that it is not so bad after all. In fact, when the WSJ compared the retired person's sentiment about life in general with that of young people, the older people were more upbeat. 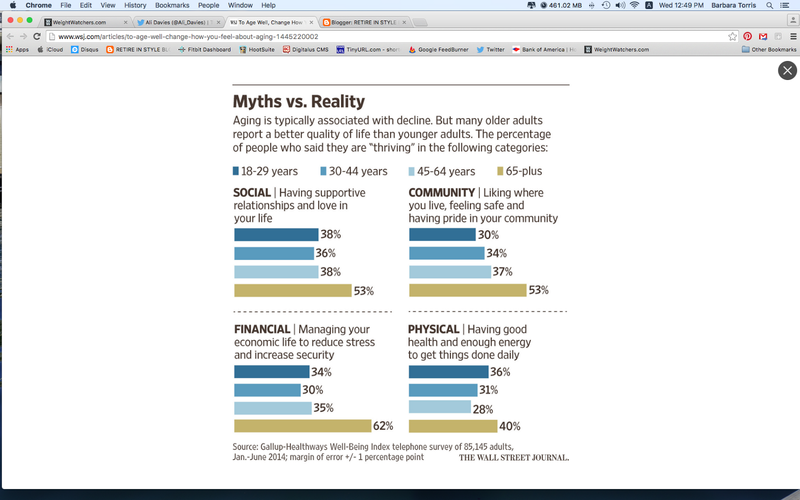 Actually 63% felt that they were financially secure compared with 38% of those between the ages of 45-64. They had better social interaction, felt more secure and had more energy to get through the day than their younger counterparts. Could this possibly be true? Well if I am an example of what your life will be like, you will travel, be physically active, have enough money to buy what you want and your social community will expand. Let me explain. When you leave your work life, you will find that your friendships are going to grow. You are going to meet people outside your profession. You will have time to grow those relationships into something that will give you comfort and strength. You are going to lead a more balanced life. 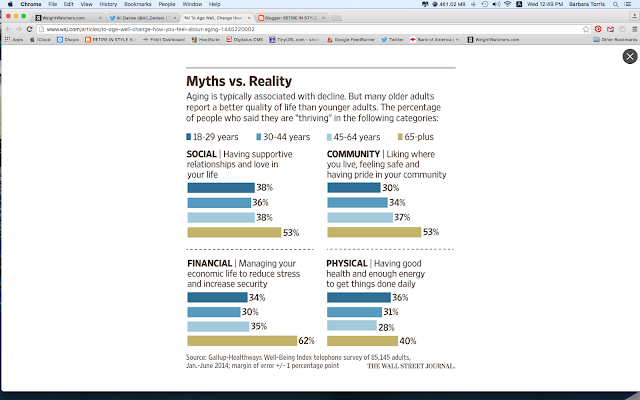 The article I read all those years ago pointed out that, as we age, we become more secure financially. First of all we actually want less. If we have done anything smart with our money, we will have enough to spend for daily needs with some left over for pure pleasure. We do not need to send children to school or college so we won't need to save as much. Medicare will help with insurance. You will probably downsize to a smaller less expensive home. You will be under less stress and have time to manage your money. I might add here that finding a way to do what you dream of as you go along helps a lot. Those that are waiting to start their life until after they retire actually may never get to start their life at all. If you are willing to be active, you are going to be surprised at what you can do. Honestly, I feel better than I did when I was 55. I went to Curves several years ago and found that I was not as old as I thought. I had just forgotten how to use my muscles like they should be used. I don't go to Curves now but I have not forgotten to wake up my muscles and get moving. 2015 We traveled to Dubai to visit our son. 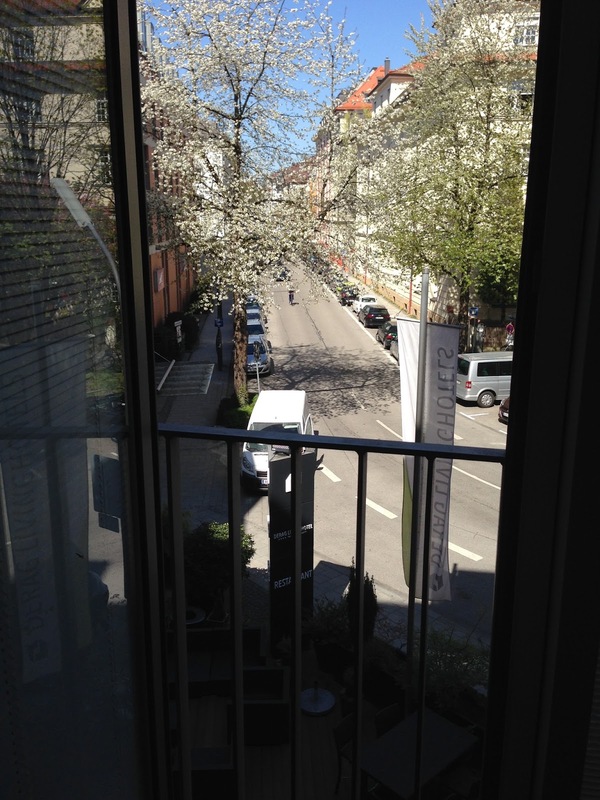 We spent 5 days in Munich too. Do I have enough energy to get through the day? You bet I do. I walk over 1 hour as many days a week as I can. I garden, travel, entertain and generally keep myself on the move. It is not easy people! Who said it was going to be. If you want to grow old healthy and happy, you need to know that nothing is free. It is always going to be work but it is on our own terms. How it turns out is completely up to us! In fact when people like me look in the mirror we feel younger than we look. All those bad things that young people expect are not happening in real life. The Journal article tells about techniques used to help change thought patterns, myths about aging and how to change stereotypical attitudes. All that said, it’s important not to go overboard and expect an entirely positive experience of aging. The key is to hold both positive and negative in balance and really understand and own the aging process. ...understand and own the aging process. Yes, a happy life truly is all about balance. Wouldn't you agree? I've been retired 6 years and find your post cogent and encouraging. There was much joy and some fear when I dialed my work number and called in old. Since then, I've found much of the fear was anticipatory anxiety. A modicum of planning sufficed. However, I also understand I spent my work-life in a more humane economy --annuities were optimistic givens and retirement plans were largely benefit-defined. Things are more complicated now and I fear for the futures of my children who are in the middle of their work in this world. My stance is, I should help them whenever I can. Desire to see faraway places with strange-sounding names largely evaporated by the time I was 60. Pretty much got that done before I married, but have helped my kids work and study abroad. I am not a brilliant man but am pleased to have conducted some light into this beautiful world --they phone me on Fathers' Day. Oh George, that is beautiful. Truly life is what it is. Dreams are nice but reality is where we live. And we always need to remember that our health is dependant on a well balanced positive/negative attitude. I would add to that to keep intellectually active either by taking classes or stretching your mind in some manner. You are absolutely right. The mind leads the body. In the end it is the mind that is the most important. A study done a few years ago in California keeping statistics on a group of aging women cohorts showed that those that suffered from severe physical disabilities were happy if their minds were good. Happiness, it turns out, comes in different forms! Excellent piece. We know that people 65 and over have the lowest poverty rate of all groups in America, largely b/c of Social Security and Medicare. But have you heard of the happiness U-curve? Apparently studies have shown that people are happiest in their 20s, then they slowly become less happy as their careers move along -- perhaps because of the stresses of family life and the reality of lowered expectations. Then as we begin to retire, our happiness starts rising again, peaking in our mid to late 60s. As one study said -- I think it was from Princeton -- on average we are happiest in our 7th decade. Well, it must be true...I have arrived at my 7th (+4 years). I love my life. I will look up the Princeton study someday soon. Very interesting stuff. I mostly agree. I have had some aspects of aging that I have not found positive, but I still rejoice that I am here to age. I had great personal tragedy five years ago. That had nothing to do with aging, but it aged me terribly. The strengths and the faith that I had developed over the years are what got me though to this point. I would give anything not to have suffered such loss, but I have grown through it. I love the life I have picked up and carried on with. I am grateful for each day. Yes, life is hard isn't it? Your courage is astounding I think. Remember the last quote, "...understand and own the aging process." Is that so very wise? I have been retired for seven years now and am enjoying my life in the Pacific Northwest, where I decided to retire. It's been everything I hoped for, and I am still active and well into my eighth decade, still going strong. This was an interesting post with much food for thought. Good for you. I suppose that is the key...still going strong. We need to do that until we have to stop. I hope that I am still in good spirits even then. Reality tells me that what is, is.